Where O’ Where Is Young Mr. Enfield? First things first, Coach Alford now has TWICE as many Sweet 16’s as Andy “Brain Surgeon” Enfield. We are of course referring to Enfield’s pre-season crack about being a better/more successful coach than Coach Alford based on NCAA Sweet 16 appearances. After finishing DEAD LAST in his inaugural PAC-12 season with a winning percentage of 0.111 (that’s right you read it correctly, 0.111%), we can’t wait to hear “Mr. Dunk City” explain how that proves he is a “brilliant basketball mind” (as USC AD Pat Haden refers to him). Oh and dear Andy, how is that “if you want to play fast go to USC and if you want to play slow go to UCLA” recruiting spiel going these days? To read our last exposé on this Trojan Rocket Scientist, see HERE. “Wooden: A Coach’s Life,” by Seth Davis, a senior writer for Sports Illustrated and a college basketball analyst for CBS. HERE is the New York Times review of the book. Not particularly glowing and of course, has the obligatory “Sam Gilbert” tarnishing the legacy stuff. I guess controversy sells – expect a book any day blaming Mother Theresa for all the poverty in India. Some great photos here from the AP. Click HERE. The Bruins are headed to the South Regional and the Sweet Sixteen! Season Ticket holders and Wooden Athletic Fund Members must submit their South Regional (March 27 & 29) ticket requests by Sunday, March 23 at 7pm. UCLA Students must submit their requests by Monday, March 24 at 4pm. A limited number of tickets for the South Regional will go on sale to UCLA alumni, facutly and staff on Monday, March 24 from 10am-4pm only. Tickste are $160 each (max 4) and located in the upper section of FedEx Forum. To request tickets, call the UCLA Central Ticket Office at (310) 825-2101. Should UCLA advance to the Final Four at AT&T Stadium in Arlington, Texas on April 5 & 7, Season Ticket holders and Wooden Athletic Fund members may request tickets online or over the phone at (310) 825-2101 until the request deadline on Monday, March 31 at 4pm. 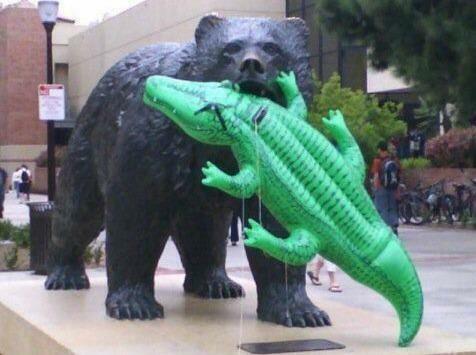 BruinAuthority note: there is speculation that this photo was taken a long time ago, from a prior meeting with the Gators. 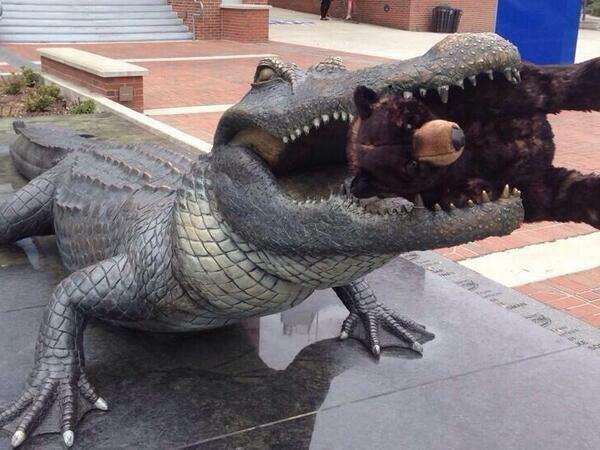 Regardless, the Gator fans are freaking out and plagerized the idea by putting a stuffed bear inside their on-campus Gator’s mouth. Read the story and see the photo HERE. According to the local Milwaukee newspaper, Ben Howland and Marquette have been in contact regarding their open coaching position. Great post, I have not seen a lot of this anywhere else. Also, I am really digging the new changes – the site is looking great. BruinArt, thanks. We try to find things that re not already plastered all over the other sites. Also, glad you noticed the changes. We work on improving the site every day. Great when someone notices! Nice smear job on Enfield. You are forgetting that unlike ucla, Enfield has to use the prior coach’s players. They are not HIS players. They don’t buy into his system so that’s not his fault. Give him five years to get rid of the current players and he will OWN the conference which is where we belong. TrojanLegion – thanks for the insight. We didn’t know USC “owns” the PAC-12 in basketball (we have a picture in our head of the other eleven PAC-12 coaches rolling on the floor when they read that). As for Enfield needing his own players unlike UCLA, you need to do a little more research. Alford and Enfield were hired the SAME week. They BOTH inherited another coach’s players. One won the PAC-12 Tournament and is in the Sweet Sixteen, and the other is still trying to find his pants. Just our opinion, but Enfield would be wise to spend the off season attending some coaching clinics (we hear Alford has a good one) and less time decorating his office and planning his Bahamas vacation.